When the Tuatha de Dannan ruled over Ireland, there once arose a conflict over who the next High King would be. Two chieftains emerged as the strongest candidates: Lir of Derravaragh and Bobh Dearg of Munster. They were evenly matched in almost all ways, but when it came to choose between them, one thing swayed the people to Bobh Dearg’s side. Bobh Dearg was married to a woman who was his equal, and Lir was alone. So Bobh Dearg was made King, and Lir returned home empty handed and angry. Bobh Dearg was worried that Lir might be angry enough at his defeat to start trouble, or even rise up against him, so to make peace between them, he invited Lir to visit. After feasting for three days and three nights, he asked Lir which of his three beautiful daughters he liked best. Lir replied that though they were all fine women, he loved Bobh Dearg’s daughter Aobh the best. Now, this had of course been Bobh Dearg’s plan all along: to make Lir a part of his family through marriage so that the other man would be bound to him by ties of love and friendship. Aobh and Lir were married, and returned to his home, where they were very happy together. Their joy only increased when Aobh had a child, a daughter named Fionnoula, and again they were delighted when Aobh bore a son named Aodh. When Aobh became pregnant a third time, they eagerly awaited the new addition to their family; twin boys named Conn and Fiachra. But the strain of giving birth to twins was too much, and shortly after they were born, Aobh died. Lir was distraught. He missed his wife terribly, but he consoled himself with his children, delighting in them, keeping them close by him all day, and all of them sleeping together in one big bed by night. His favourite thing was to hear the children singing, their sweet voices twining in beautiful harmonies. Bobh Dearg was sorely grieved when he heard of his daughter’s death, and he asked his other two daughters if one of them would be wiling to go to Lir, and be his new wife, and help to take care of the children. Aoife agreed to the match. She married Lir, and was well pleased with the day, and she set herself to be a mother to her sister’s children. But Aoife found that there was no room for her in that house. Lir barely paid attention to her; all his focus was on his children, who did not need or want a mother, when their father already doted on them so. Shut out of his happy family, Aoife began to grow bitter. She thought long and hard about her situation, and saw no way out for her, but one. One day, she went to Lir and asked him if she could take the children to visit her father Bobh Dearg. Lir was very reluctant to let the children leave his side – they had never been apart from him since the day they each were born – but Aoife had the children so excited to go and see their grandfather that they began to beg him to let them go, and at last he relented. Aoife set out with the four children, and on the way she stopped by Lake Derravaragh, not far from their father’s castle. There she got down from her chariot and told the children to go swimming. It was a hot day, so the boys ran straight into the water, throwing off their clothes. But Fionnoula paused, full of misgivings. She asked her stepmother was she going to come with them? But Aoife did not reply. When the four children were in the water, Aoife pulled out a wand and transformed the children into swans. At the last minute, seeing the look in Fionnoula’s eyes, she amended her curse, leaving the children their human voices and their human reason. Transformed, the children wept. They begged their stepmother to undo the curse, but Aoife was unable to change them back, so powerful was the spell she had created. Instead, she put an ending to it. She told the children that they would have to spend three hundred years on that very lake, three hundred years on the stormy sea of Moyle between Ireland and Scotland, and three hundred years on another lake, and would regain their human forms when a king’s son from the north married a king’s daughter from the south. Then Aoife got back into her chariot, and went to visit her father. She spent a moth in Bobh Dearg’s house, and told him the children were still with their father. When the time came for her to return, she told Lir that the children had decided to stay with their grandfather. But her deception could not go unnoticed forever. At length, Lir set out to fetch his children back, and both he and Bobh Dearg were shocked when each realized the other did not have the children. Both men raced back to Lir’s castle to confront Aoife, but on the way they heard the sound of children’s voices coming from the lake. Lir searched high and low for his children along the lakeshore, but he could not find him; the only living things on the lake were four beautiful swans. But then the swans swam over to him, and he heard his children’s voices speaking out of the birds’ beaks. They told him what their stepmother had done to them. In retaliation for her crime, Bobh Dearg transformed Aoife into a demon of the air, and she went shrieking off into the sky to be buffeted and blown about. And when the wind blows hard, sometimes you can hear her shrieking still. Lir did everything he could to ease the children’s transformation. He brought his whole household to the lakeshore, and he held feasts and games and entertainments all day long for his children, so that they could almost forget that they were swans. At night, they would swim out over the lake and sing together for their father’s people on the shore. Three hundred years passed quickly. Then the day came when the four children were compelled to fly away. They took their leave of their father and his people, promising to come and find them after the three hundred years on the Sea of Moyle were past, and then they took to the air. The Sea of Moyle was a vicious, stormy place, and the four swans were buffeted by the high waves, and shivered in the cold winds. Fionnoula found a jagged rock for them to perch on, and they agreed that if they were ever separated by the rough waves and weather, they would look for each other there. The first time a storm blew in, they were scattered from each other. Fionnoula came first to the rock, and waited long for her brothers. One by one, bedraggled and exhausted, they made their weary way to the meeting-place. Fionnoula placed her brother Aodh beneath the feathers of her breast to warm him, and took Conn and Fiachra each under one wing, and she sang to them to keep their spirits up. Every time a storm came, the swans were scattered, and Fionnoula held her brothers in its aftermath. In summer, the sea was stormy and rough, but in winter conditions were even worse. The icy water was so cold it froze their feathers, and broke them away, leaving their raw skin exposed to the sting of salt water. Three hundred years passed slowly. At last the day came when the swans could fly back to Ireland, to go to the last of the lakes. They detoured on their way, flying over Lough Derravaragh, hoping to call out to their father. But they flew over tumbled stone, with grass growing through the cracks, and saw no sign of their father or his people. The time of the Tuatha de Dannan had passed while they were gone, and their father was gone. Sadly they settled on the lake, and though they grieved that they would never see their father or their people again, they were relieved to be on so gentle a lake after enduring such hardship on the Sea of Moyle. The years passed. A long time later, a monk named Malachi came to live on an island in the middle of the lake, and began to build a monastery there. He saw the four beautiful swans swimming stately by, but he was shocked when he heard them sing and speak in human voices! Malachi spoke to the swans, and they told him their sad story. He told them in turn of his god, stories of the Bible and Jesus Christ. Fionnoula and her brothers were very interested in the new faith, and asked if they could convert, but Malachi explained that as they were swans, they could not. He did, however, continue to teach them the new faith, and the five of them had many spirited conversations. The swans would sing for Malachi in the evenings, glorious melodies and sad songs of loss for their old life. One day, messengers came to the lake from the king’s son of Munster. They told Malachi that their master was going to get married that very day to the king’s daughter of Ulster, and for a wedding gift, the bride had asked for four swans from her betrothed. They had heard that the swans of this lake were magical, and sang, and they had come to bring the swans away with them, to give to the bride as a gift. No sooner had they caught the four swans and pulled them from the lake, however, than the feathers melted off their bodies, and they turned back into their human forms! The wedding had fulfilled the final condition of Aoife’s curse, and they were restored. But when they looked at each other, they could see that these were not the bright children of Lir any longer. Nine hundred years old, each of them was wizened, white-haired and ancient. Knowing they would not live long now that the magic was not sustaining them, Fionnoula begged Malachi to baptize them all so that they might go together to Heaven. 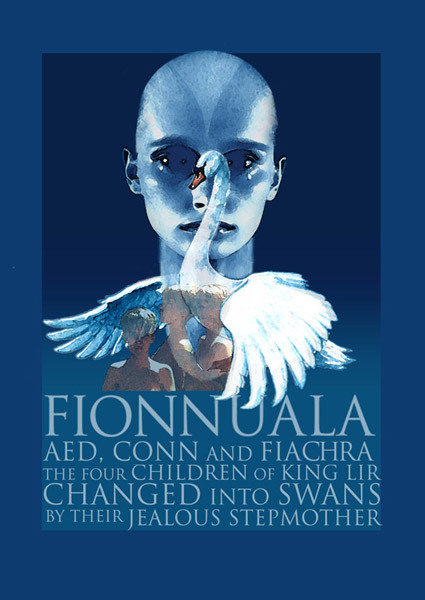 He did this, and with her last breath, Fionnoula told him her last wish: that her brother Aodh be buried at her breast, Conn under her right arm and Fiachra under her left, the way that she had held them when they were swans.